This section will help you choose which Dambuster Deicer products are best for all your winter roof ice problems. 1. Will the salt from Dambuster Deicers damage my roof? Absolutely not! Dambuster Deicers are made up of a special, patented formulation of nontoxic and environmentally friendly de-icing salts. These salts dissolve slowly and completely, and will not harm your roof. 2. How long will one Dambuster Deicer Brick last? One Dambuster Deicer Brick will last through about one foot of snow. Keep in mind that excessive rainfall will dissolve the Dambuster Deicer products much more quickly than melting snow. 3. How many Dambuster Deicer Bricks will I need to protect my entire roof at once? This depends on your roof. If you have a flat roof with one drain, you may need a Dambuster Deicer Brick six-pack, or one of the larger 50-lb Dambuster Deicer Blocks. For an average shingled roof, a six-pack of Dambuster Deicer Bricks is likely the minimum. For shingled roofs with multi-directional facing, more than a six-pack of Dambuster Deicer Bricks may be required. 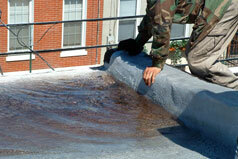 Overall, it depends on the size of the roof you would like to protect, and the number of drains the roof has. 4. Is it too cold in my area to use Dambuster Deicers? It is never too cold to prevent Dambuster Deicers from working. If the Winter gets colder, then fewer ice dams will form, as thawing during the day will not occur. The salt from Dambuster Deicers only works when it needs to, which is during warmer daytime temperatures that lead to melts. 5. I have a flat roof. Will Dambuster Deicers work for me? Absolutely! Dambuster Deicers were originally designed for flat roofs. 6. I have a sloped roof. Will Dambuster Deicers work for me? The Dambuster Deicer Bricks are best on 10/12 slopes or less. A good rule of thumb is that if you cannot walk up your roof, Dambuster Deicers may not remain in place. 7. Will Dambuster Deicers ruin the soil, landscaping or vegetation around my house? Dambuster Deicers will not ruin your soil if they are used properly and the drainage from your roof does not empty into the middle of your important garden or vegetation areas. Additionally, by spring, the salt from Dambuster Deicers will have diluted enough to keep soil unaffected. 8. Why don't I just throw rock salt onto my roof instead? You could do that, but the rock salt will either dissolve or wash away within hours. Dambuster Deicers products are stable, long-lasting designs. 9. I've heard about electric wires. Do they work against roof ice? Electric wires may work against roof ice, but they have disadvantages: they are expensive, they are dangerous, and they are not very efficient. 10. Should I just climb onto my roof with a hammer, an ice pick and a bucket of boiling water? These are risky, ineffective tactics to combat roof ice. First, you can easily fall on an icy roof. Second, the boiling water is dangerous to carry and only stays hot in freezing weather for seconds. Third, you can puncture the roof or damage the surface with a hammer and ice pick. For more answers on how Dambuster Deicers can solve your winter ice problems please contact us directly.